Silver power coated, 16-1/2" steel dual trailer wheel with 5-1/2" offset features an 8 on 6-1/2 bolt pattern and meets Department of Transportation standards Lowest Prices for the best tires and wheels from Dexstar. 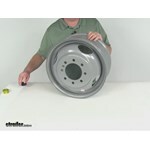 Dexstar Dual Wheel with Offset - 16.5 x 6.75 Rim - 8 on 6.5 part number AM20730 can be ordered online at etrailer.com or call 800-298-8924 for expert service. 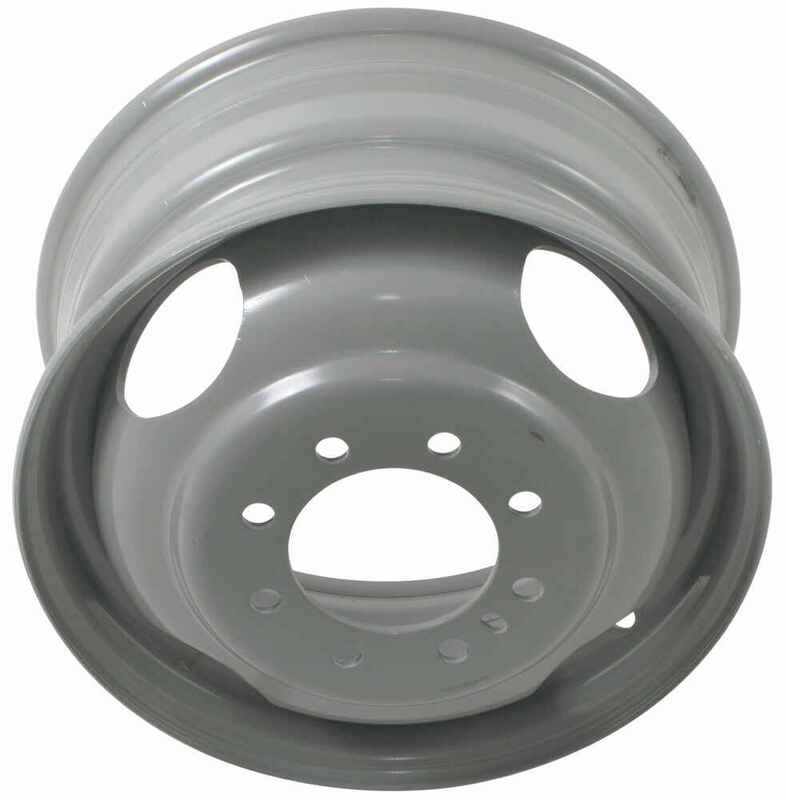 20730DX Dexstar Dual Wheel - 16.5"
Gray power coated, 16" steel dual trailer wheel with 5-1/2" offset features an 8 on 6-1/2 bolt pattern and meets Department of Transportation standards. 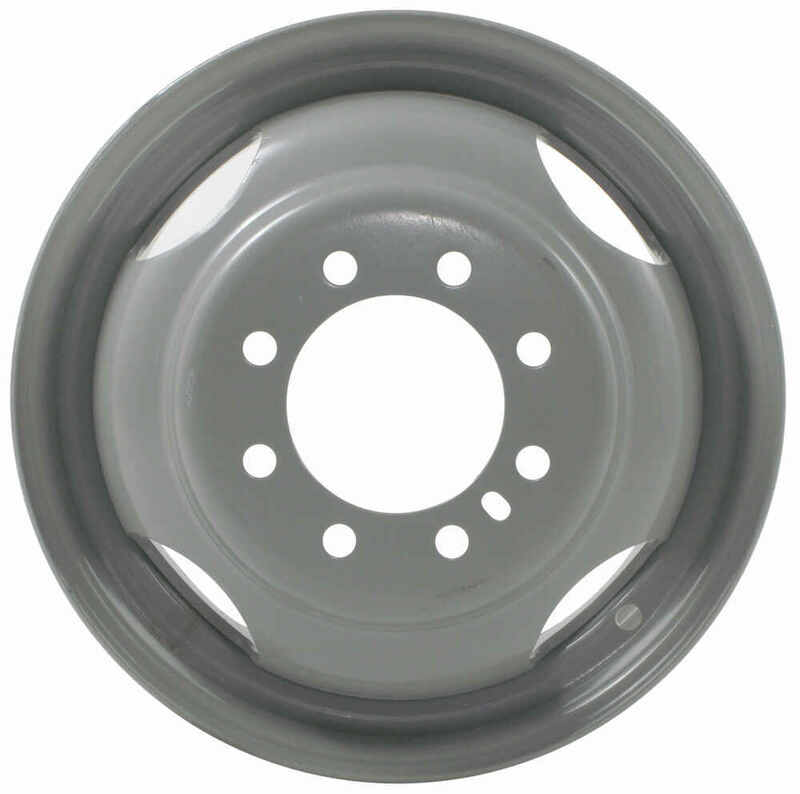 This 16-1/2" x 6-3/4" Hub-piloted wheel has a 4.88" diameter pilot hole. ±5.5" Offset allows wheel to be used as either the inner or outer wheel of a dual-wheel setup. Rust-resistant 3-step powder coat. Radial tire has a 14-ply rating and a 3,860-lb max load at 110 psi. Hub-piloted, dual steel wheel has a 4.88" pilot hole and 5.35" offset. Rust-resistant 3-step powder coat. Complimentary roadside assistance included. 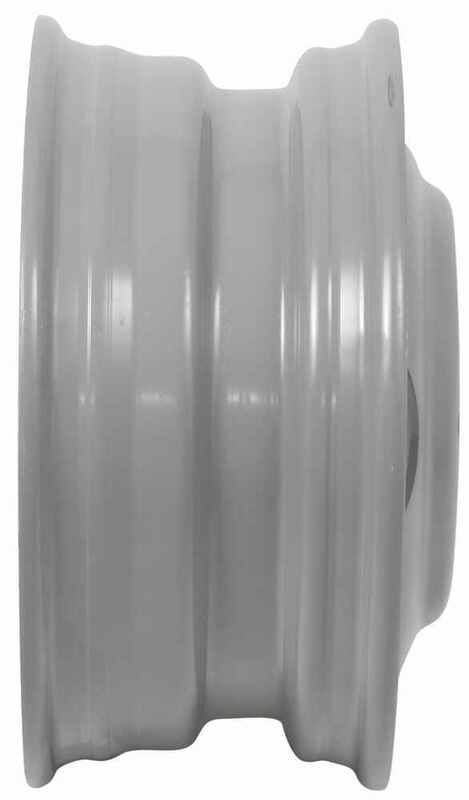 Trailer Wheel Lug Nut - 5/8"
Today we are going to review part number AM20730. This is the Dexstar 16 1/ 2 inch by 6 3/4 inch steel dual trailer wheel with the positive 5 1/2 inch offset and the 8 on 6 1/2 inch bolt pattern. 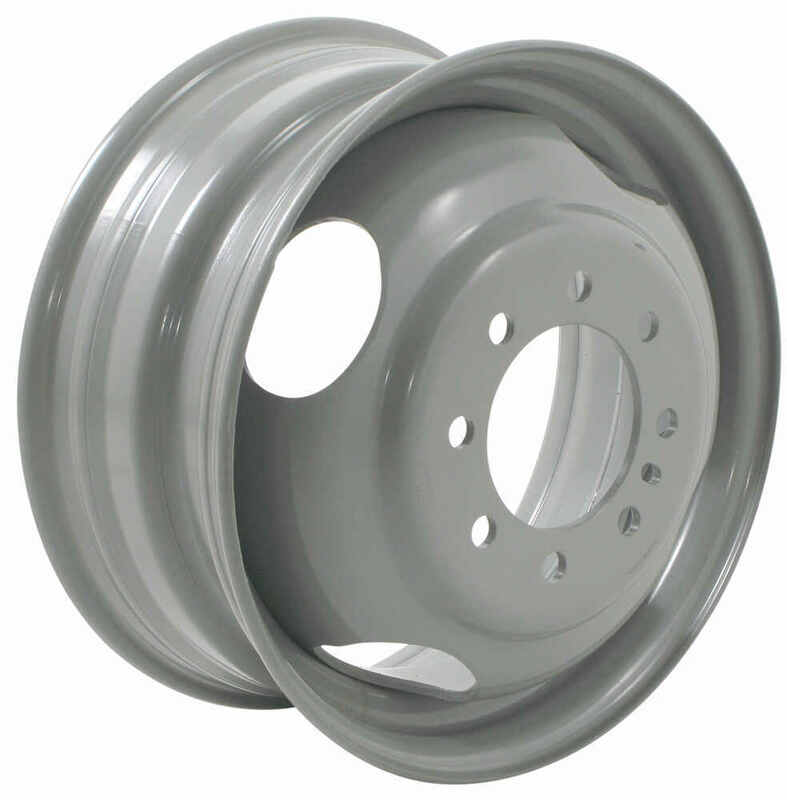 This wheel is a sturdy steel construction; has a nice gray powder coat finish over an eco primer over the whole wheel, front and back. This will give you excellent corrosion resistance and this wheel does have the high positive offset, which will ensure that the wheels positioned closer to the trailer frame. This is a high quality wheel that meets the department of transportation specifications. This is a hub piloted designed wheel, and by that they mean that this large center hole will center on the axle using the center hub. It will not center off the lug nuts, it will actually center off this large hole in the center. That is why the bolt holes will not have a chamfer to them, so it does require to use a 5/8 inch flange nut, which we do sell separately, to install this wheel on your trailer. The rim dimension on this is a 16 1/2 inch diameter by 6 3/4 inches wide. If you go to measure, I just want to show you how you measure it. When you measure diameter you won't be measuring edge to edge, you'll be measuring bead seat to bead seat or the inside to inside. Basically when a tire is mounted on this wheel the tire beads would seat here, so the diameter would be bead seat to bead seat. If we put a ruler on there just to give you an idea, you can see it comes up to 16 1/2 inches in diameter and the width you would want to do the same thing. You will measure bead seat to bead seat, so inside to inside. The width on this wheel is 6 3/4 inches, so the diameter is 16 1/2 inches this way, width is 6 3/4 inches wide. The bolt pattern on this wheel, you can see, is a 8 hole 6 1/2 inch bolt pattern, and the way you will do that on a wheel that has a even number of lugs, like in this case eight, just pick one of the lug holes and you'll be measuring from the center of that hole to the hole directly across from it; center to center. In this case, we'll put center to center, 6 1/2 inches; so 8 holes, 6 1/2 inch hole pattern. The large hole that I mentioned earlier, that this is a hub piloted wheel so the pilot hub diameter on this hole is going to measure right at 4 3/4 inches, so 4.75 inches. As I mentioned also this does use the wheel lug size of a 5/8 inch flange nut. The weight capacity on this wheel is 3100 pounds and again this wheel has a 5 1/2 inch offset, positive. Basically what that is saying is this mounting surface of this wheel, if you would measure it from the center line of the wheel and it goes out to the face of the wheel which is the positive offset. The measurement from that center line to right here is going to be 5 1/2 inches. That should do it for the review on part number AM20730, the Dexstar 16 1/2 inch by 6 3/4 inch steel dual trailer wheel with the positive 5 1/2 inch offset and the 8 on 6 1/2 bolt pattern. .
1 year later and its still going strong. Etrailer.com is the best website for anything you need trailer related. Site is easy to navigate, has tons of useful information and if you need help from a person they always answer the phone with top notch customer service. The Dexstar dual wheel, # AM20730, can accept several tire sizes depending on the diameter and load carrying capacity you need. But, the 2 most common tire sizes for a 16.5 x 6.75 wheel are either an 8.75-16.5 tire or a 9.50-16.5 tire. We do not carry tires in this size but a local tire shop should be able to get you the size you need though it may be a special order item. For a wheel that matches what you listed we have the Dexstar Wheel part # AM20720DX which is 16-1/2 inches in diameter and has a width of 6-3/4 inches. This has 6 lug bolt pattern. For an 8 lug we have the part # AM20725DX. If you were looking for a dually wheel setup we have the part # AM20730 instead. This has 8 lug bolt pattern. The wheel stud (lug) holes in the Dexstar Dual Wheel with Offset # AM20730 are non-chamfered holes that accept a 5/8-inch stud diameter. I went to our warehouse with my trusty digital caliper to measure the holes in this item. I checked several holes and their size ranged from 0.660 to 0.665-inches. This wheel mounts with 5/8-inch flange nuts # 95188. The 7.50-16 is a light truck tire size sometimes used on trailers. It fits a 16x6 inch wheel. We have several wheels in this size with an 8 on 6-1/2 bolt pattern but since you have dually wheels you will want # AM20783. I have included a link to a video review of this wheel for you. You will need to check the bolt pattern and the pilot hole. The standard bolt pattern is 8 on 6-1/2 inches. The pilot hole in the middle is often in the 4.75 to 4.78 inches range like you see with the Dexstar Dual Wheel with Offset - 16.5 x 6.75 Rim - 8 on 6.5 # AM20730. Oil bath hubs are not uncommon. Let me know what you have and I'd be happy to check for a compatible option. Wheel offset is always measured from the center line of the rim to the hub face. In the case of Dexstar Dual Wheel with Offset # AM20730 the rim provides 5-1/2-inches of positive offset, which moves the tire surface closer to the vehicle. A typical application for this component is as a front wheel on a dually truck or RV.